Hello! 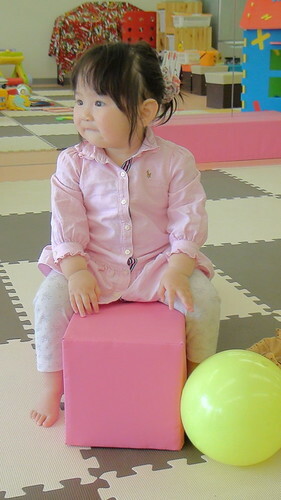 Today we went to a small playing space for kids. 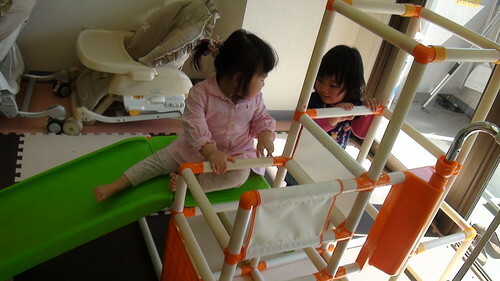 It has lots of toys and Miyu enjoyed them very much. She wears her new scrunchy. It's with fleece fabric and good for folding her hair. 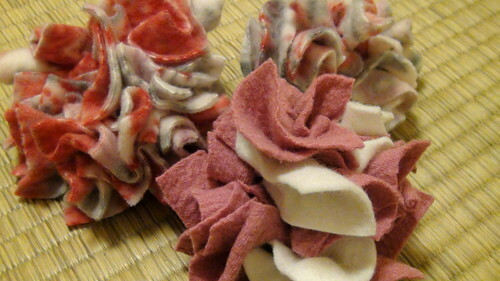 I found an easy way to make non-sew scrunchies with felt from a Japanese book. Fleece or thick wool fabrics are also good. You need only fabrics, a piece of elastic, scissors and a hair pin. 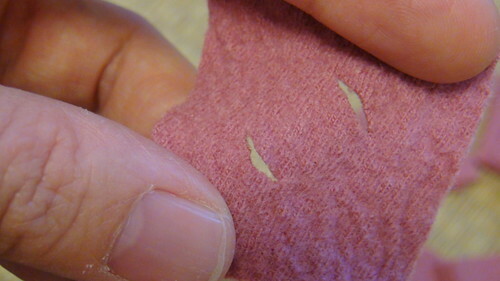 At first, cut fabrics in approx. 2 inches square or circle pieces. The way from the book was in circle. It's a little hard for me so I cut fabrics in square pieces. Please make approx. 20 pieces for one scrunchy. You can mix colors. 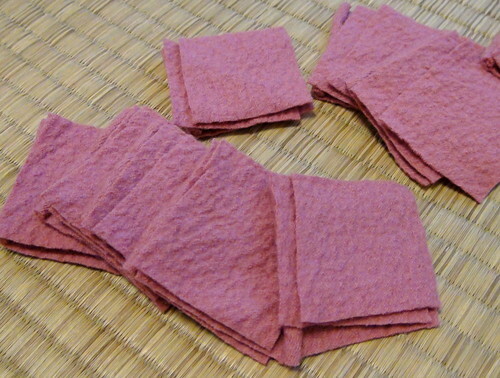 Then fold it in bias and cut two parts like the picture, so you make two holes in one piece. Prepare a piece of 8 inches elastic and lace it with a hair pin (or bodkin) thorough the two holes. Knot the elastic. That's all! 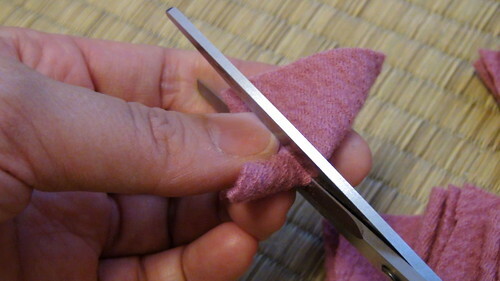 If you cut fabrics in squares, it takes only 30 minutes or so. Miyu calls them "Flower". So I named them "flower scrunchies". The center one is with wool and felt fabrics. The back ones are with fleece. 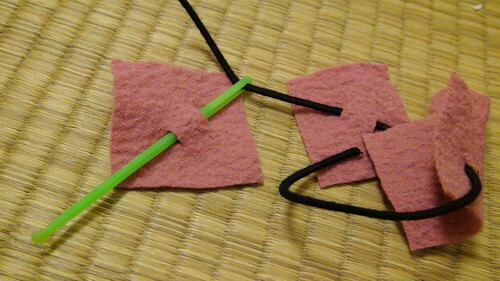 The Miyu's one(The smallest one) is with circle pieces. 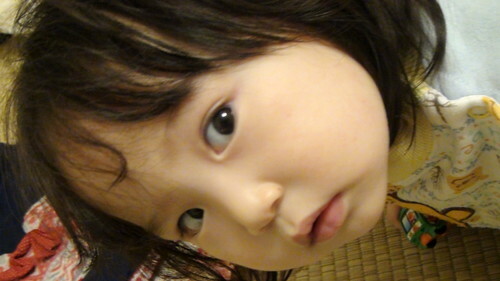 Miyu is 1 and a half year old now. She still cannot walk but speaks a lot. 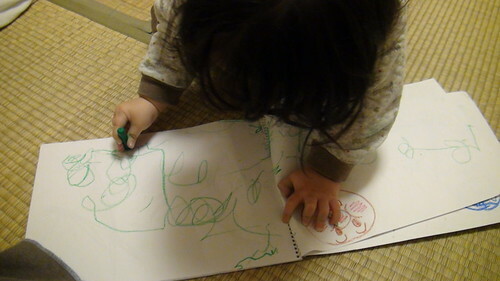 Her most favorite playing is drawing. 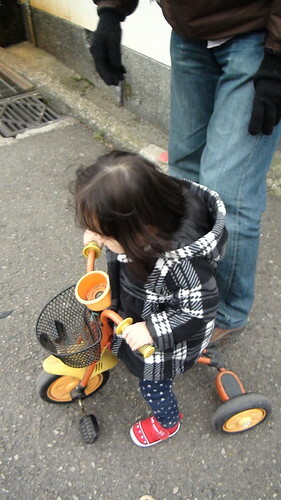 And tricycle. 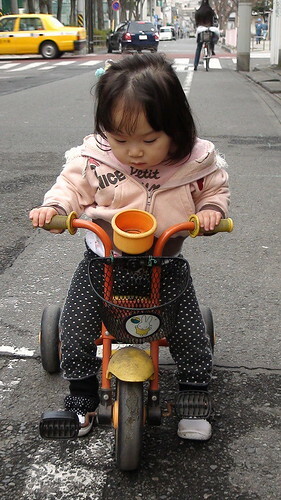 She cannot pedal it but go forward a little by kicking. I made some new items for her. 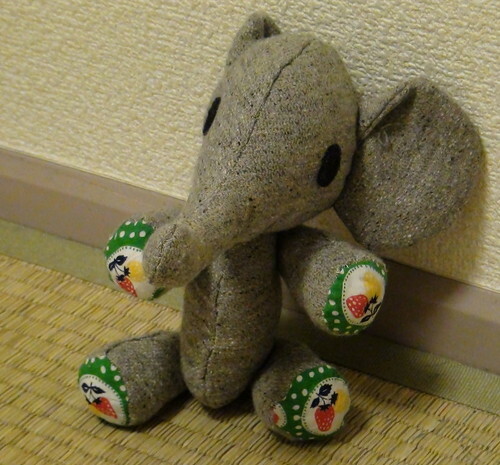 One is this elephant. I got the gray fabric from SWANY. I love the wool very much. So I made accessories for me with it. 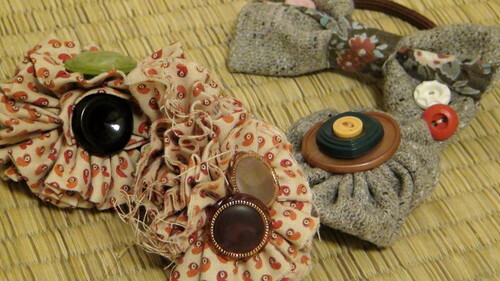 They are hair elastics and brooches. I put my favorite buttons on them. 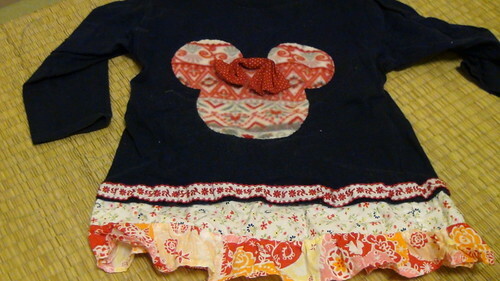 I appliqued and put ruffles on her simple T-shirt. It's Minnie! The applique is with fleece fabric so it doesn't fray. 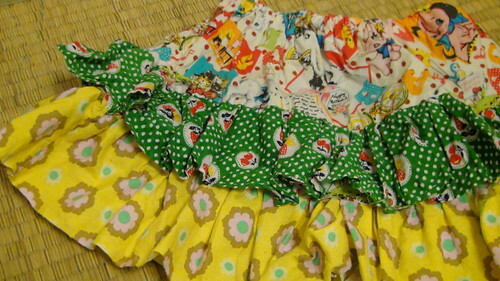 This is an irregular skirt with patchworked fabrics. 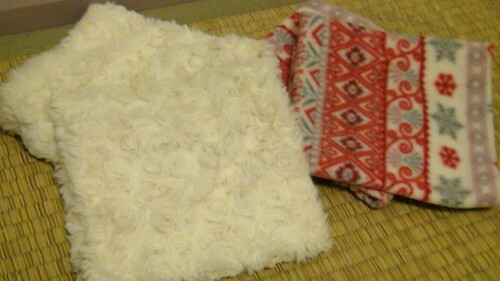 I made a wool skirt for me with the same pattern. 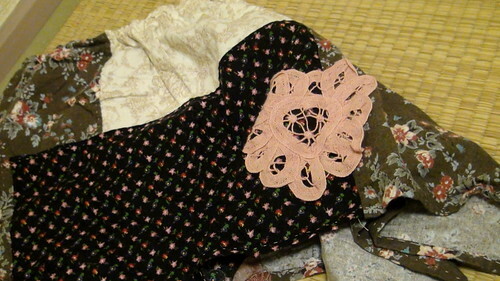 Miyu likes the lace very much and touches it whenever she puts it. 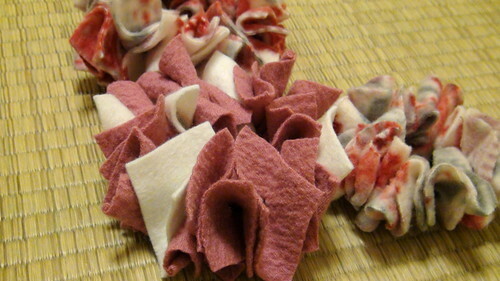 I began having sewing lessons for mothers and elderly people. One of the items is these ankle warmers. It's very easy to sew but they make us very hot and comfortable. I enjoy having lessons. Everyday I think what we make in next lessons. We already made ankle warmers, Sarubobo plushes and zipper pouches. What do we sew next?? ?